Back of card: Based on the second Major Arcana, the High Priestess, shown above. In the usual four images, in the usual four corners of the card, in maroon. Note how her head sticks up between the trees. On the back of the card, the space between the trees becomes two large white ovals. May be inverted. Booklet included: Yes, 64 pages, 2.6 x 4.75 inches, or 65 x 120 mm. Instructions in English, Italian, Spanish, French & German. 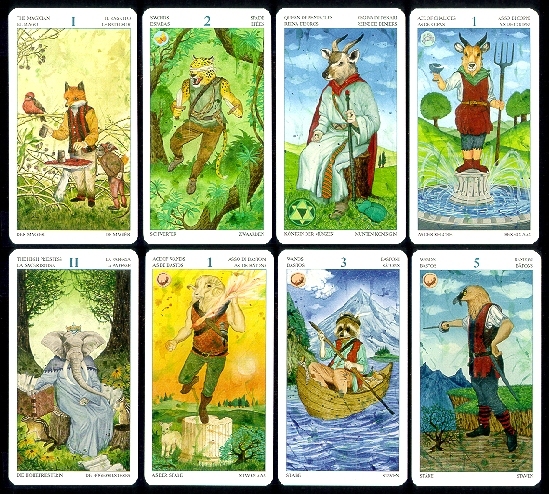 Comments: The usual 22 Major Arcana cards, the usual four suits (Wands/Salamanders, Swords/Butterflies, Pentacles/Beetles, Chalices/Crabs), the usual four court cards (Knave, Knight, Queen, King). The instructions identify the principal animal on each card, which, as you can see, does not seem to be related to the class or type of animal represented by each suit. Forgive me, I was never the animal type. I have no comments.